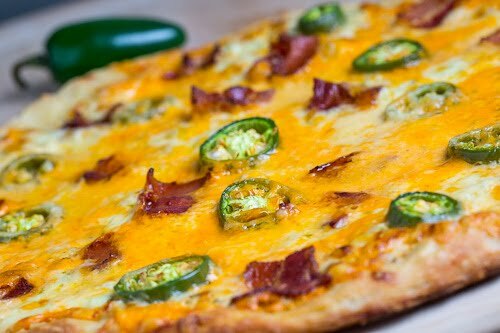 A jalapeno popper inspired pizza with plenty of jalapenos, bacon and cheese on a jalapeno ranch sauce. It has been a while since I last made a pizza and the craving for one had been building up over the last while until finally I just had to make one. On top of my list of new pizzas to try was one inspired by the flavours of jalapeno poppers. Jalapeno poppers are jalapeno peppers that are stuffed with cheese, commonly cream cheese and cheddar, and either coated with bread crumbs and fried or wrapped in bacon and grilled. With those ingredients it is pretty easy to envision a pizza topped with cheddar, along with mozzarella, sliced jalapenos and bacon and that just left the cream cheese and the crispy bread crumb coating to work in. 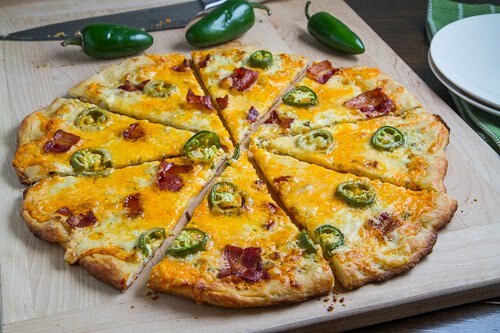 As I often do when writing a recipe, I start out be searching the web for similar recipes and all of the recipes that I found for jalapeno popper pizza either called for spreading the cream cheese onto the pizza dough in place of a sauce or to simply sprinkle it on top along with the other cheese. Since I enjoy pizzas with sauces I was not really thrilled with either idea and I was thinking about something more along the lines of a mornay sauce with cream cheese or a ranch dressing with cream cheese mixed in. After thinking about it for a while I had an idea, why not take the opportunity to add even more flavour and jalapeno goodness to the sauce?, and with that the idea for a jalapeno ranch dressing was born! With the cream cheese down that left only the crispy breadcrumb topping! Although I was thinking about simply topping the pizza with panko bread crumbs, I was a little worried that they would burn in the high temperatures before the pizza cooked so I left them out. In all honesty you will not miss the crispy bread crumb topping as this pizza is already really amazing without it! Serve with extra jalapeno ranch dressing for your dipping pleasure! It is like a sea of melted cheese with tiny islands of spicy jalapeno heat! Mix the cream cheese into the jalapeno ranch dressing. Roll the dough out into a circle roughly 12 inches across and spread the creamy jalapeno ranch dressing over it. 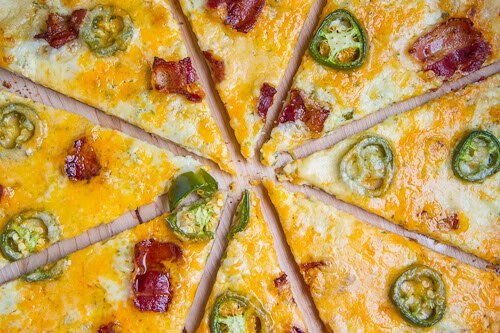 Sprinkle the jalapeno peppers, bacon, and cheeses onto the pizza. Well, well, well … were we not JUST discussing the awesomeness that is your affection for jalapeno poppers? This looks incredible! This looks fantastic! I just had to comment. 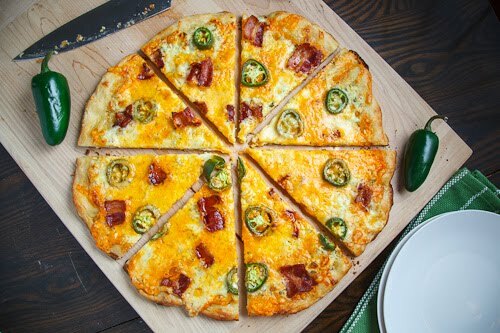 I love Jalapeños,and with this idea wow I can imaging how good the pizza will taste,this week end it will be my afternoon dinner,wish me luck can't way. Tanks for this awesome Recipe. hhh I love poppers….the pizza looks great. oh YUM! what a delicious looking pizza! gorgeous photos too! I think all that time you spent not making pizza was actually a good thing because all those creative juices made this one uber amazing! Kevin, this sounds like a winner. I'm sure my son-in-law and grandsons would love it! WHEN will they perfect food replicators?!!! I want a piece of this NOW!!! Yum! I love jalapeno poppers. Now I can make a meal out of them without feeling quite as guilty. That jalapeno popper grilled cheese looks great too. Oh, thanks for making me hungry again (I just ate lunch)! So delicious looking, and I love your photography. Oh wow, that looks so good!! I couldn't find Jalapeno Ranch dressing- but I added chopped pickled Jalapenos to normal Ranch and it tasted great! I'll be much braver with the amount of Jalapenos next time! Thanks so much for the recipe! now this is my kind of pizza. I could eat this whole one. Yep – I could and I would love every slice!